The Pandavas complete their twelve years in exile. Now, as per the agreement, they have to go into hiding for the thirteenth year. 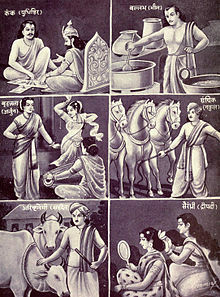 It is quite a challenge since the entire Bharata knows the five gallant brothers and their beautiful wife Draupadi. So they decide to disguise and take refuge in Matsya, the Kingdom of Virat. But how would they keep their identity a secret? Listen to this fascinating episode by clicking the player below.